Our company is reputed for its extensive collection of wine coolers. Manufactured using high grade metals, our range of wine coolers is provided with rounded handles and wavy two edges. It is extremely functional as it helps to keep your priceless wines cool for a longer time. It also adds an accent to the ambience of your home bars as well as the professional bars where these are used. 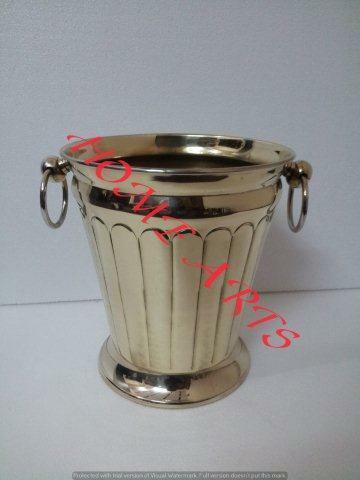 These wine coolers are available in various designs and different shapes and finishes. Wine coolers are subject to customization in accordance with the clients’ specifications and requirements. Simple and elegant looking, these wine coolers are a must for any home bar. Your guests will love these items and will not stop praising your much desired taste. Incorporated in the year 2010, at Moradabad (Uttar Pradesh, India), we “Home Arts” are the partnership firm, engaged in manufacturing, exporting and supplying a premium quality range of Decorative Underplate, Flower Vase, Decorative Candelabra, Crystal Items, Chaffing Dishes, Napkin Rings, Decorative Lanterns, etc. Being the renowned organization, we are backed by an advanced infrastructural base that comprises of different units such as production, quality testing, procurement, warehousing, and sales & marketing. Under the leadership of “Mr. Rizwan Shamsi” (Director), we have been able to meet the requirements of our clients. We export our product in UK, USA, Europe, USA, Canada, Australia, South Africa, UAE, etc.